Some info about myself: I was born and educated in Berlin (Germany) and moved to Wales in 1996. Since 2000 I've lived in Grangetown, Cardiff and currently work in Liverpool. At the moment I am the co-chair of GORWEL, the Welsh Foundation for Innovation in Public Affairs (www.gorwel.co ) Enjoy the blog! All comments very welcome! The piece is only less than 5 mins long but it is impressive and leaves one with a fully painted mental picture. 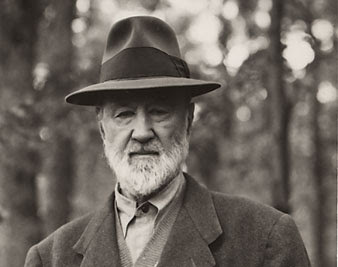 Ives' music, it seemed to me back then, was like a painting by Edward Hopper, only that Ives was painting outside urban scences where Hopper wanted to look into the inside of people's places from outside. That Ives composed radically metropolitan scences shows even more clearly in his piece Central Park in the Dark. If you did not know the title, the ever increasing noise of urban sounds swelling to a mighty explosion in the piece would leave you in no doubt that you are in the middle of a city. What Ives manages however is to portray the fragile contrast between a city's harmonic background bordering on silence and the discordant hubbub that surrounds us on a daily basis. The piece starts off in near silence with the strings once again setting the scene, this time less melodious, giving off a whiff of a metalic sound. As the wood winds intermittently intersect with the strings, the scene still remains distant in sound and impact on the listener. Next, the flute takes up a theme and hovers above strings and wood winds. None of them even attempt to merge or meld into one coherent whole. Finally a singular violin and a piano furnish additional moments of urban sounds, until all climaxes in pandemonium as we know it from the streets of New York. Ives added a beautiful note of contrast as the musical tumult cuts out suddenly and the strings are heard to continue to the very end of the piece. It creates a moment of surprise as you realise they have been there all along, no matter how loud the city was. The piece's crescendo is difficult to play (there is a Bernstein/NYPhil version here). In particular, what appears like an unwanted disturbances of the strings by random noise actually requires careful calibration of the sound levels. The BBC Philharmonic conducted by John Storgards gave their all but at times it was not quite enough. In particular, as the flute and piano starts to overlay the string theme, the string section needs to be low enough, almost whispering, so that flute and piano are recognised as distinct voices. The Bridgewater Hall has a decent acoustic but the orchestra did not quite pull it off. From where I sat in the centre of the stalls the flute was not quite audible and the single violin, played sensitively by the concertmaster, did not quite emerge as different from the main body of sound. It was more a confluence of music rather than a caleidoscope of discrete notes from different players. Still, it was amazing to hear this piece live for the first time. The evening also contained a muscular rendition of George Gershwin's Rhapsody in Blue, delivered with gusto by Peter Donohoe. I prefer the version for Jazz orchestra over the full orchestral arrangement (by Ferde Grofe) but both Donohoe and the BBC Orchestra gave a spirited performance which made me tap along with my foot. The evening ended with George Antheil's Symphony No. 6, a pleasing piece of work sitting comfortably somewhere between Stravinsky and Shostakovich and a composition by George Walker called Lilacs. Walker set his music to Walt Whitman's 'When lilacs last in the door-yard bloom'd'. Joshua Ellicott gave it a rounded sound, perhaps at times struggling against an overwhelming orchestra, and it made me wish to hear more from this song cycle. The evening concert was recorded for broadcast on Wednesday 14th Feb as part of the BBC Radio 3 in Concert Series. So you can tune into BBC Radio 3 next Wednesday at 7.30pm to hear it or catch up with it on BBC iPlayer.